In the interview, Matyushin (de Krog) talks about organizing mass disturbances in Donetsk in the spring [of 2014] and, subsequently, taking part in combat against the Armed Forces of Ukraine. 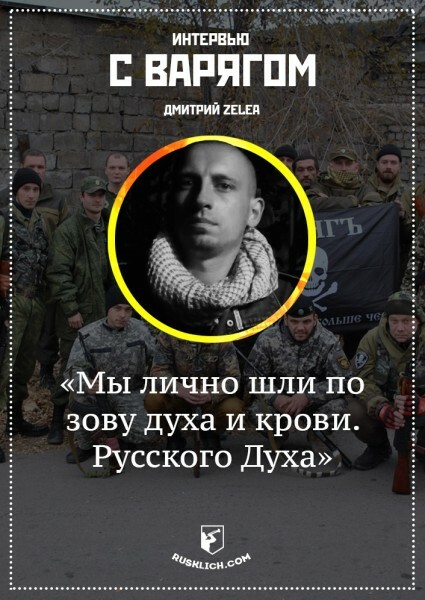 In the foreword to the interview, the article authors write that Matyushin is “one of the founding fathers of the DNR [Donetsk People’s Republic], a person of right-wing conservative views, and someone without whom Russian Spring would have been impossible.” Matyushin himself confessed that he used to be a skinhead, and has been working to create the DNR since the mid-2000’s. “It all started in the early 2000’s. That was when I ended up in Moscow and joined the skinhead movement, which was becoming popular among the youth in the CIS countries. Gradually, my views evolved in the direction of National Bolshevism, and I joined the NBP [National Bolshevik Party]. When Eduard Limonov [founder and former leader of the NBP] entered into a coalition with liberals, I left the NBP and started supporting the ESM [Eurasian Youth Union]. By the end of 2005, the protest movement in Donbas started winding down. That was when I, together with my comrades from the coalition “For Ukraine Without [Viktor] Yushchenko,” created the social movement “Donetsk Republic.” Ever since then, my political path has been tied to that organization, and the organization, to my political path. We held many conferences, round tables, marches, rallies, and campaigns… By the end of last year , a part of the “Donetsk Republic” segregated itself into a combat wing of right-wing radical youth called “Varyag crew,” which played a special part in the events of the “Russian Spring,” Matyushin told the interviewer. “We, personally, went there to follow the call of our spirit and our blood. The Russian Spirit. We set out on the path to restoration of the metaphysical [sic] Kitezh Town [mythical sunken town, also referred to as the Russian Atlantis]. We did not see our land as part of Ukraine, and the people supported that strongly. The large number of Russian flags and constant chanting “Russia!” heard at rallies and protests during the “Russian Spring” confirm that,” the interview says. According to de Krog, he successfully created his own Donetsk squad, “Varyag” [Varangian, Norseman], consisting of like-minded people from Russia and Ukraine. “At a certain point in my life, when the young republic was in danger, I realized that I would be more useful to my land with a weapon in my hand, rather than in the parliament (I was a deputy of the DNR VS [Supreme Council]), because “history is created not by idle talk and papers, but by iron and blood” (Bismarck) [VoU note: paraphrase of the Otto Bismarck quote “The great questions of the day will not be settled by means of speeches and majority decisions … but by iron and blood”]. Matyushin posing with the Varyag squad flag. The motto reads: More enemies – more honor. “So I started creating my squad. Its members were people who have been by my side for many years, on the path to our land’s independence. We also had new members, who were like us in spirit. Plus, Russian volunteers came to our aid… At first, we were part of the [DNR] Ministry of State Security structure. We took part in battles for the [Donetsk] airport, escorted humanitarian convoys along the DNR roads that could come under fire, scouted occupied territories, and captured saboteurs on our land. Right now, we are on duty in the Donetsk city commandant office, ensuring order in the city, and serving as a link between the government and the self-government bodies. In its entire history, the squad lost three men, and four were wounded, myself included,” he went on to say. This statement is a stark contrast against the generally accepted propaganda parrot cry that the population of Donbas has, allegedly, risen to fight fascism. It looks like, in reality, fascists are the “founding fathers” of the DNR, and make no attempts to hide it. 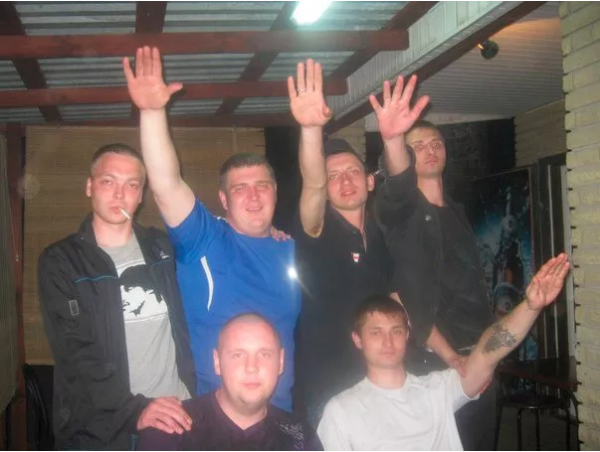 Alexander “de Krog” Matyushin and friends, performing a Nazi salute. The political affiliations of the “DNR” founder (top row, second right) are clear without further comment. Matyushin believes that the war between Ukrainians and Russians is happening because Ukrainians do not accept the idea of the great empire, and are not Slavic people by blood. “Russophobia and “anti-imperialism” are the cornerstones of Ukrainian nationalism. Plus, Ukrainians are not Slavic by blood. Compare the folk archetypes of Russian and Ukrainian peoples. In Russian folk tales you see Kyiv the capitol city, Mother Rus, and Russian Bogatyrs [warriors]. Ukrainians, however, have Cossack Mamay, sitting cross-legged in a Turkish manner, wearing Turkish pantaloons and a steppe-dweller hairstyle, playing some weird Asian “Baida” musical instrument called [VoU note: likely referring to a kobza]. The ideal of Russian beauty are blue eyes and a fair braid. The Ukrainians’ idea are “black brows and brown eyes,” Matyushin says. 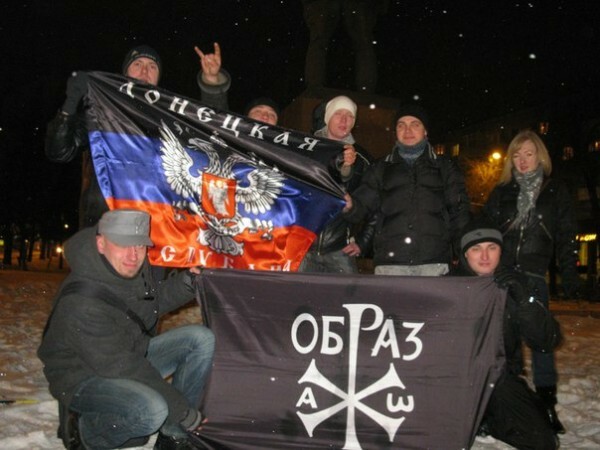 Alexander (de Krog) Matyushin is widely known in Donetsk as an organizer of numerous “Russian marches” and a participant of vandalistic anti-Western and anti-Ukrainian events. His social network pages contain many pictures from these events, held in Donetsk from time to time in the past few years. In 2013, de Krog took part in the attack on the Donetsk cultural center “Isolation,” which was visited by the US Ambassador John F. Tefft. It is also known that Matyushin used to be an activist of the Russian right-wing extremist organization “Russkiy Obraz” [Russian Image]. 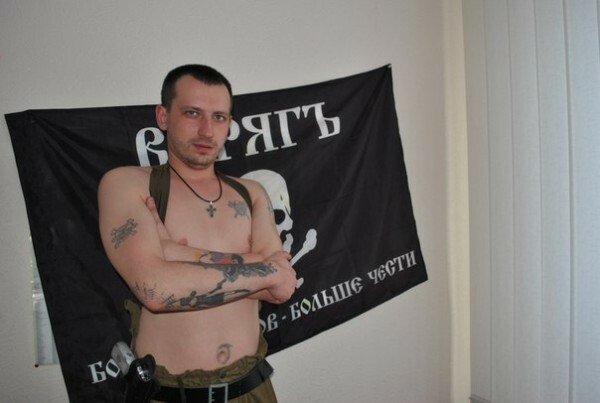 The combat wing of RO was the so-called “Combat Organization of Russian Nationalists” (BORN), whose members Nikita Tikhonov and Yevgenia Khasis committed a number of national hatred murders in Russia, and are currently serving their sentences in a penitentiary. Flags of the Donetsk People’s Republic and Russkiy Obraz. However, while in Russia, members of Neo-Nazi and skinhead gangs are put behind bars, in Donetsk they are issued weapons and given complete freedom of action. Moreover, personalities like de Krog acquire the status of “liberating warriors,” “fathers of the republic” and champions of truth, sacralized by Kremlin propaganda. This is what it’s like, “anti-fascism,” Putin-style. With a distinct smell of brown. This entry was posted in English, Media, Opinion & Analysis, Pictures, South&Eastern Ukraine, War in Donbas and tagged #RussiaInvadedUkraine, Alexander de Krog, Alexander Matyushin, DNR, Donetsk Peoples Republic, fascism, Neo-Nazism, radical right-wing, Russia, Russian spring, Ukraine, Varyag. Bookmark the permalink.